Mortals with souls stained with corruption go to Hell. Most other souls sink down to the Underworld, a place of different horrors, of quiet misery, protracted grief. Here the torment is not punishment but erasure, as everything you are is eaten away by the coruscating wind. Should you awaken to see its grey deserts, rejoice, for you are not in Hell. Then despair, for other agonies await. 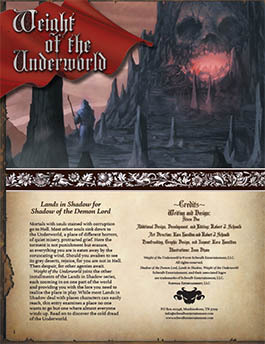 Weight of the Underworld joins the other installments of the Lands in Shadow series, each zooming in on one part of the world and providing you with the lore you need to realize the place in play. While most Lands in Shadow deal with places characters can easily reach, this entry examines a place no one wants to go but one where almost everyone winds up. Read on to discover the cold dread of the Underworld. Buy Weight of the Underworld PDF from Schwalb Entertainment or DriveThruRPG!